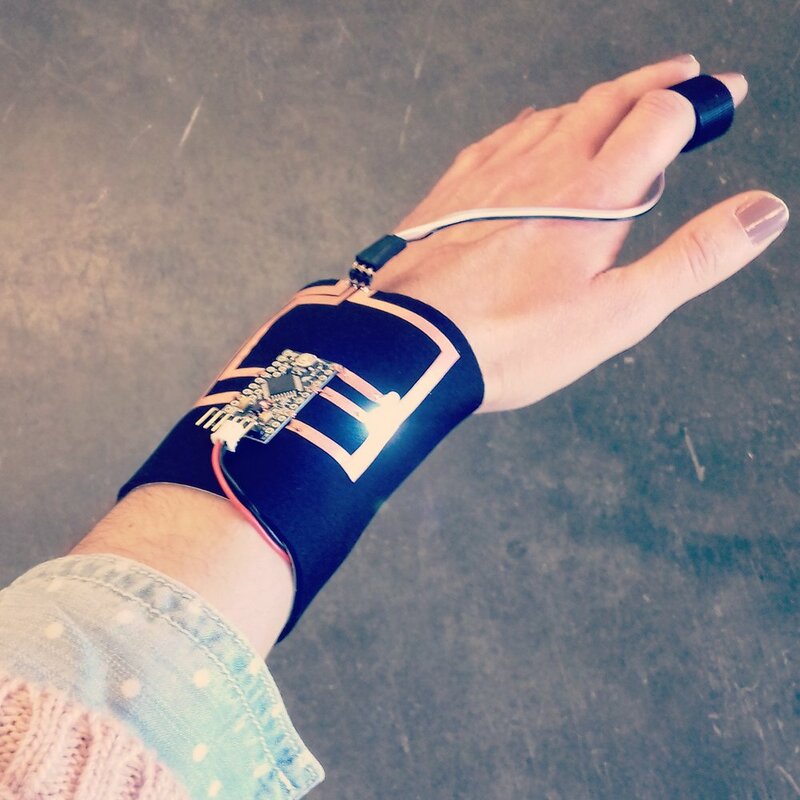 This wearable synth was inspired by the complexity of human emotions in conjunction with the comfort of human touch. Housed in a weighted sweater, the user experiences a subtle pressure on their shoulders, while the instrument is being played. Mimicking the feeling of being hugged, the user can squeeze the arms of the sweater, actuating the pressure sensors, intern synthesizing tones. With four sensors placed throughout the sleeves, the user can manipulate tones as they discover their placement. This experience emulates the interactions humans have with one another, discovering how each other can work together to create harmony and comfort. This project began with researching how to the Ardunio Uno could synthesize sound through the use of pressure sensors. Using the Mozzi, an audio synthesis library for Arduino, I was able to modify various features of the sounds wave, allowing the sweater to be played like an instrument. The design of this piece through several renditions, all of which using a sweater as the main structure. Beginning with a shape similar to a lyre, the sweater was flipped, turned, and cut before settling the natural shape. Consuming close to 75% of the time creating this project, prototyping took many forms. The purpose of prototyping is to refine the product, to understand what works and what doesn't. While it is important to proceed with the intended idea, its is also important to accept changes along the way. After completing the pressure sensors, they were hooked up to the circuit using alligator clips to record the readings. NOTE: the final circuit contained four pressure sensors, two potentiometers, and an audio port. While we cannot see where the current is, we can predict/see how it will move. 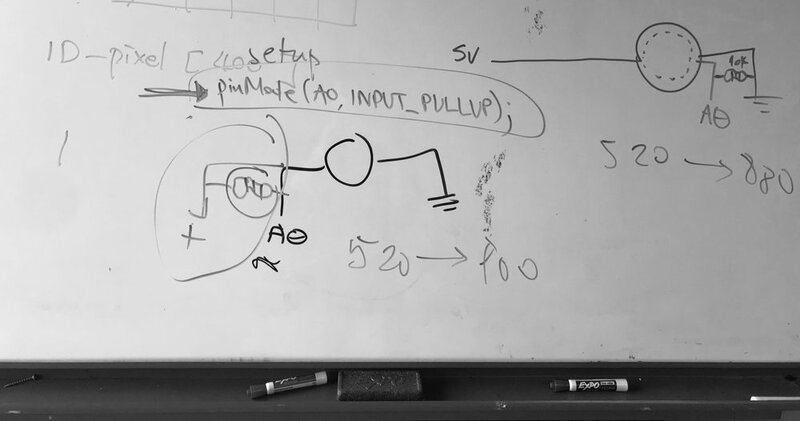 Using a white board to draw schematics, the ability to quickly modify the circuit allows for a clear, clean, and effective way to keep moving forward on a project. The piece was on exhibit from June 1-2, 2018 at The Grocery, in Beacon Hill, WA. Since it's first exposure, it has become been enjoyed with and played with by friends and strangers alike. Everyone has a different interaction with the piece the first time they use it. While some users are gentle and timid with the sweater, others can be quite rough, allowing each interaction to sound new. As this project progressed, it became relevant it wouldn't be possible without using open source code. Being the case, I cannot take all the credit for my code. 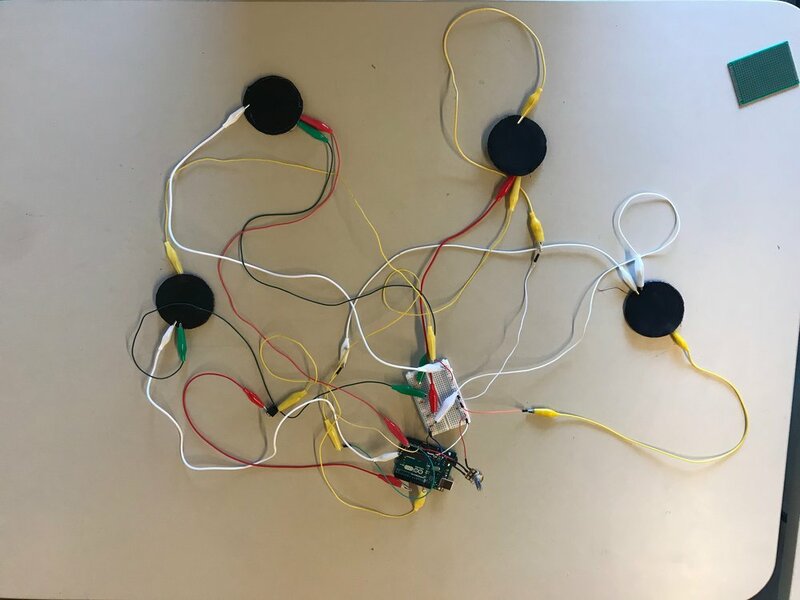 However, hours of work went into modifying an existing code from the Mozzi library to allow the sensors to properly communicate to the Arduino Uno.